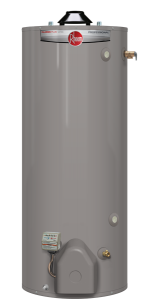 Boasting more hot water at a lower operating cost, an exclusive fuel shut-off device, an eco-friendly burner and high altitude compliance, the Atmospheric Professional Classic Plus Series water heater from Rheem is the total package. Easy to light and carrying the EverKleen patented system to fight sediment build-up, this water heater also comes with standard replacement parts. How can we at The Plumbing Connection begin to describe this wonderful water heater from Rheem? It is fantastic at what it does and the 8 year warranty that comes with it as a safety net is a nice touch. But one of the best parts about this device is that we install it! Call us today at: (941) 747-2727 and we can get one of these beauties installed into your home immediately!